You sit in the train and see each and every one being occupied with an interesting game. No, it is not an update of the World of Tanks, neither it is the magazine of crosswords. It is Sudoku. What is it? How to play it? Why is it so popular? Let's find out. Just grab a pen or a pencil, have a cozy place to sit and concentrate and enjoy the world of Sudoku, thanks to the best essay writing service getessaynow.com! Sudoku is basically a Japanese translation but not originally from the Land of the Rising Sun. The correct name would sound like "Su Doku" which is "the numbers must be single". Indeed, the rules of this game require that. Although, the first sprouts that resembled the game were noticeable in France in the 19th century, the modern look as it is now has been invented by a single person, the American Howard Garns. The puzzle game has quickly gained its popularity due to its simplicity and availability. The instructions to the game are available on the whole web and sooner or later you will comprehend the main idea of playing this game, but to make you become truly interested in it, here are a few reasons why personally I have chosen this game over hundreds (maybe thousands, I don't know) of other games. You finally get a chance to use your logic! That's right, you've heard it correct, no mathematics skills but the lucid mind and a drop of logical thinking (maybe more) are required. Some people are scared of this game just by looking at it as it looks like have been created for geniuses in Math. As soon as you start playing it you will realize that the game is not about the numbers in boxes but something else and you don't need to calculate these figures. Nobody will scold you for wasting time, aka procrastinating. It is actually a good engagement while standing in a queue or having a long trip in a transport. But be careful as it is very addictive, such game can eat the whole day (or night). It is absolutely for free! Just type for the game and you will get lots of material for printing and making your own book of Sudoku or pay a few cents for the ready paper. 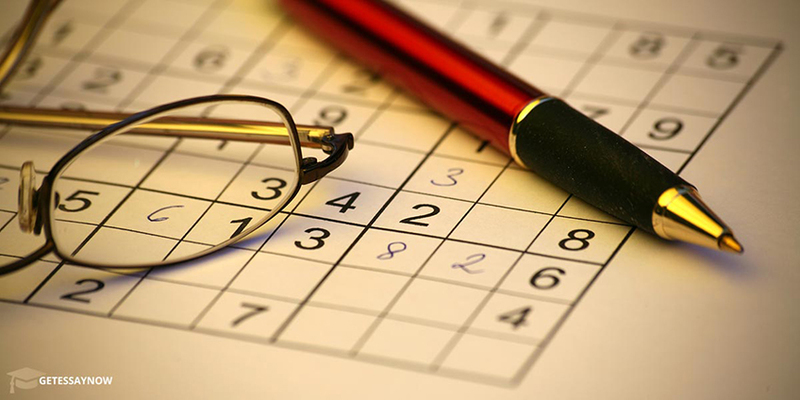 Moreover, there are lots of free websites offering new patterns of Sudoku of every level of complexity online. No need in extra battery charging or other stuff. So, you can play it everywhere by having a list of printed version, not worrying about having your phone or laptop died in the middle of the game. Besides, for some amazing reason the society doesn't consider it as a game for fun but a good puzzle for personal development. Double luck! You can participate in a competition and win a grand prize! The Sudoku world competitions are being held every year for true lovers of this game and it became a serious concurrence. Check out yourself, maybe you're the next Sudoku pro? The Sudoku game is fairly honored the title of the easy and at the same time complicated game. It doesn't contain any head-breaking and distracting patterns on the gaudy background but a white grid (as a rule) with tiny boxes filled with numbers or letters or even colors. However, to fully comprehend the pleasure of this puzzle game, you need to practice a lot.